Tats nice to hear from you again. Just had a glance at your recipe list, but sure will try one of them soon and post them in my blog. I could eat many of these! This recipe sounds good. 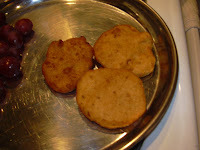 I never tried vadai because it doesn´t exist here where I live, but I´d love to. I like trying new things. Thanks for visiting my blog. I answered your comment there but decided to make you a visit too.